The World Bank Board of Directors approved today a US$250 million financial package to support Jordan’s process to reform the energy and water sectors, two critical public services which are challenged by scarce resources and further burdened by a sharp rise in demand caused by the influx of Syrian refugees. – Caroline van den Berg, World Bank Lead Water and Sanitation Specialist. Jordan’s historic vulnerability to the fluctuations in fuel prices, coupled with the frequent interruptions in piped natural gas from Egypt since the outbreak of the Arab upheaval in 2011, have severely taxed the budget. To compensate for the gas shortages, Jordan has resorted to importing more expensive diesel and fuel oil. This development encouraged the Government to develop and implement programs to diversify and reduce cost of energy supply through the development of domestic renewable energy resources and alternate natural gas supply options for power generation. On the water front, Jordan has historically grappled with water scarcity, which has forced the Kingdom to maximize its use of shared resources, while becoming more dependent on non-conventional, and often very energy-intensive, water infrastructure. 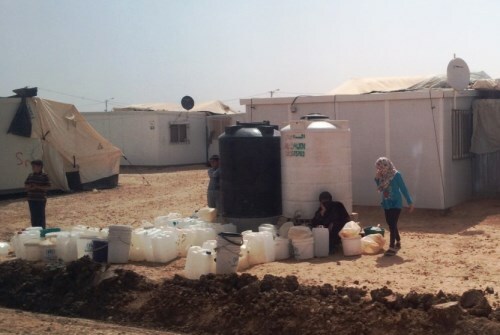 A series of external shocks, including the fluctuations in oil prices and the influx of the Syrian refugees in the country, have rapidly increased the cost of water. In response, the Government is implementing a sector reform program that aims to optimize the allocation of water resources, while reducing the use of energy in the sector – a program that would be supported by the DPL. The plan will optimize the use of existing surface water resources while allocating increasing flows of treated wastewater to farmers and industry to support economic growth while reducing the over-extraction of groundwater. – Ferid Belhaj, World Bank Director for the Middle East. The water sector is one of the largest consumers of electricity in the country, and hence any increase in energy efficiency will help to reduce the cost of water and reduce emissions and subsequently the carbon footprint of the sector. In addition to the new US$250 million loan, the World Bank’s portfolio in Jordan comprises three projects amounting to US$430 million, as well as 15 trust fund grants for a total of US$83.4 million. More information can be found on the World Bank website, where you also may find the program document. On June 29 we reported about the Tunisia Road Transport Corridors. This project, worth a total of $231 million, has now been approved by the World Bank Board of Directors. The Project Development Objectives are (i) to reduce transportation cost and time and improve road safety on select road corridors between lagging regions in Tunisia and more developed areas and (ii) strengthen the Ministry of Equipment’s capacity in road asset management. The World Bank’s Board of Directors will soon be discussing the proposed Tunisia Road Transport Corridors Project. This project involves a total of $231 million, of which $200 million is provided by the World Bank. On Friday, April 24, the Board of Directors of the World Bank will decide on a proposed project in Morocco to improve primary health in rural areas, involving a total of $100 million from the World Bank, for a total of over $220 million. The stated Project Development Objective is to expand access to primary healthcare in targeted rural areas in the Program Area. The operation will contribute to the Government’s health sector program by disbursing funds against achievements of the following key results: (a) expanding equitable access to primary care in rural areas; and (b) improving health system governance at the primary level.